She waited for the call promised by her son in the evening but only got the heartbreaking news that Indian Air Force pilot K Praveen was no more. Twenty-seven-year-old Flt Lt Praveen was among the 20 killed in Tuesday’s helicopter crash during a rescue mission in flood-ravaged Uttarakhand. As a pall of gloom descended at Praveen's TVS Nagar residence in Madurai on Wednesday, his promise to speak to his mother after completing the day's rescue mission yesterday in the hill state turned out to be his last words. Praveen was among the five IAF personnel who perished along with six from the Indo-Tibetan Border Police and nine from National Disaster Response Force of the National Disaster Management Authority when IAF's Mi-17 V5 chopper crashed while on a rescue mission. The IAF pilot had told his mother that he would talk to her after the day's mission to rescue people stranded in flood ravaged Uttarakhand. "He was my only son. He used to be always active. Becoming a pilot was his ambition and after a brief stint in software firm TCS he joined the IAF," a shattered Manjula said in choked voice. "He spoke to me at 9.45 am on Tuesday and told me he will be calling me again in the evening. But we only received the call conveying the shocking news about the crash of the helicopter at Gaurikand and death of Praveen and others," she said. The family was looking for a bride but fate willed otherwise. 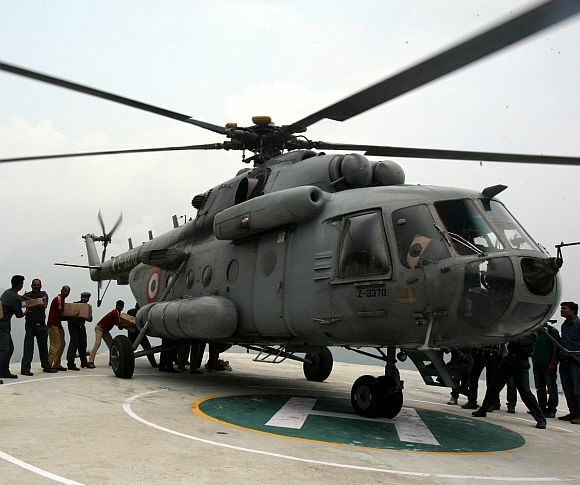 The MI-17 V5 chopper was on a rescue mission from Gauchar to Guptkashi and Kedarnath when it crashed north of Gaurikund. Relatives and friends gathered at Praveen's residence to offer their condolences. Praveen did his BE (Mechatronics) from the Thiagraja College of Engineering in Madurai and joined the IAF as a pilot at Bengaluru before being shifted to the north. Gujarat Chief Minister Narendra Modi announced compensation of Rs 5 lakh for the families of the personnel killed in the crash. Uttarakhand Chief Minister Vijay Bahuguna also announced a compensation of Rs 10 lakh to the next of kin of the victims. Uttar Pradesh Chief Minister Akhilesh Yadav said a compensation of Rs 20 lakh will be given to the families of two IAF personnel who hailed from the state. The personnel were identified as Sgt Sudhakar Yadav, who hailed from Santkabir Nagar, and JWO Akhilesh Pratap Singh from Jagdishpur, Amethi, official sources said in Lucknow. The government would give Rs 20 lakh assistance to their kin while taking responsibility of free education to their wards, Yadav told mediapersons.